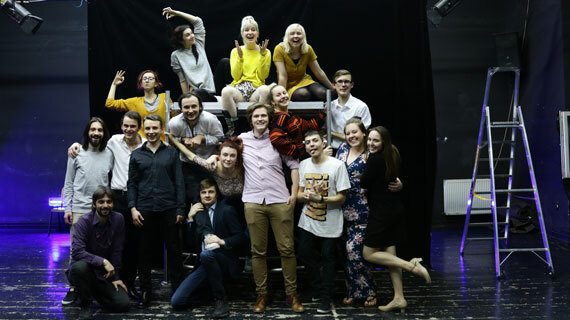 While many students dedicated their spring breaks to relaxing at home, six students from the Southern Utah University College of Performing and Visual Arts used their week off to share The Last Yankee by Arthur Miller with students from SUU’s sister college in Cluj-Napoca, Romania. Students left for Romania on March 6, and, after hours of flights and layovers, made it to Cluj that weekend. They then met with the graduating classes of theatre students, who performed two plays for them. “The plays were in Romanian, and so different from what we do here,” explained Will Cowser, the senior who organized the trip as a part of his EDGE Project. After watching the other students perform, both schools joined together for an acting workshop, which focussed on commedia dell’arte, an early form of professional theatre which focuses on masked acting and character work. “They study [commedia dell’arte] a lot there, especially in that class because their professor has a lot of training in it. They made their own masks and let us wear them.” Cowser said. Both groups of students shared familiar exercises, as well as introducing each other to new practices and ideas. The exchange ended with the SUU students’ performance of The Last Yankee, a 50-minute play by Arthur Miller. The play was selected because of its classic American style and themes. By then, the SUU and Romanian students had formed a close relationship, and the Romanian students even made a Facebook event for the performance in order to invite as many people as they could.